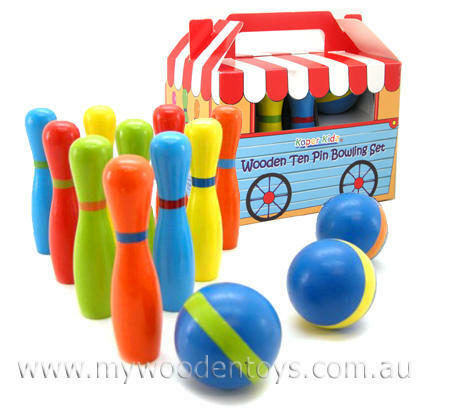 Wooden Ten Pin Bowling Game is a sweet small multi-coloured version of the very popular traditional game. This little set comes with 10 pins in lovely bright colours and three balls. This is a great little set to take with you to a friends house. This is the perfect toy to learn about distance and co-ordination and most importantly its great fun. Size: Pins are 10cm high and the 3 balls have a 5cm diameter. We like this because: "Perfect size and the pins stand easily."